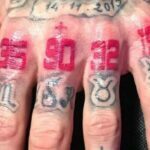 Following Real Madrid’s 3–0 win over Real Sociedad on Sunday, Sergio Ramos made a point of jogging over to a very specific fan in order to complete a very unusual exchange. 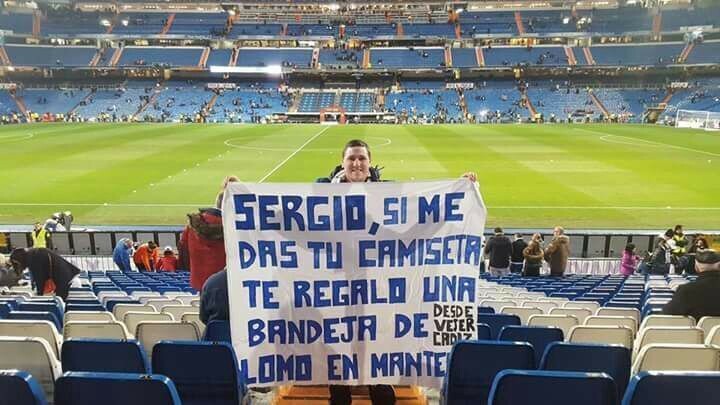 The fan had been holding a banner that read “Sergio, if you give me your shirt I’ll give you a tray of lomo en manteca” throughout the match. Lomo en manteca (pork in lard—the perfect post-match snack) is a specialty of Spain’s Andalusia region, which is where Ramos is from. And apparently this offer was too goo to pass up for the Real Madrid captain. "Sergio, si me das tu camiseta te regalo una bandeja de lomo en manteca". 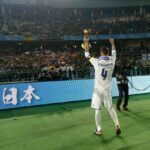 Fans carrying banners begging for a specific player’s shirt have become quite common at matches these days and they get mixed results. But this man clearly knew his target exceptionally well. Local media identified the fan as Sergio Sanchez, who is from Vejer de la Frontera in southern Spain, which is known for its pork in lard, or “lomo en manteca,” as it’s called in Spanish. So remember: If you want a player’s shirt, be sure to bring their favorite regional delicacies.